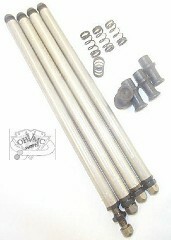 Adjustable solid lifter kit will correct all problems associated with hydraulic lifters and reduce valve train weight. Fits Panheads 1953 - 65 with stock length cylinders. Will also fit 1948-52 with stock length cylinders if later model tappet blocks and lifter bodies are used.